Kirtan or Kirtana (Sanskrit: कीर्तन; IAST: Kīrtana) is a Sanskrit word that means "narrating, reciting, telling, describing" of an idea or story. It also refers to a genre of religious performance arts, connoting a musical form of narration or shared recitation, particularly of spiritual or religious ideas. With roots in the Vedic anukirtana tradition, a kirtan is a call-and-response style song or chant, set to music, wherein multiple singers recite or describe a legend, or express loving devotion to a deity, or discuss spiritual ideas. It may include dancing or direct expression of bhavas (emotive states) by the singer. Many kirtan performances are structured to engage the audience where they either repeat the chant, or reply to the call of the singer. A person performing kirtan is known as a kirtankara (or kirtankar). A Kirtan performance includes an accompaniment of regionally popular musical instruments, such as the harmonium, the veena or ektara (forms of string instruments), the tabla (one-sided drums), the mrdanga or pakhawaj (two-sided drum), flute (forms of woodwind instruments), and karatalas or talas (cymbals). It is a major practice in Hinduism, Vaisnava devotionalism, Sikhism, the Sant traditions and some forms of Buddhism, as well as other religious groups. Kirtan is sometimes accompanied by story-telling and acting. Texts typically cover religious, mythological or social subjects. kirtan (Sanskrit: कीर्तन) has Vedic roots and it means "telling, narrating, describing, enumerating, reporting". The term is found as Anukirtan (or Anukrti, Anukarana, literally a "re-telling") in the context of Yajna, wherein team recitations of dialogue-style and question-answer riddle hymns were part of the ritual or celebratory dramatic performance. The Sanskrit verses in chapter 13.2 of Shatapatha Brahmana (~800–700 BCE), for example, are written in the form of a riddle play between two actors. The root of kirtan is kirt (Sanskrit: कीर्त्). The root is found in the Samhitas, the Brahmanas and other Vedic literature, as well as the Vedanga and Sutras literature. Kirt, according to Monier-Williams contextually means, "to mention, make mention of, tell, name, call, recite, repeat, relate, declare, communicate, commemorate, celebrate, praise, glorify". kirtan, sometimes referred to as sankirtana (literally, "collective performance"), is a call-and-response chanting or musical conversation, a genre of religious performance arts that developed during India's bhakti devotional traditions. However, it is a heterogeneous practice that varies regionally according to Christian Novetzke, and includes varying mixture of different musical instruments, dance, oration, theatre, audience participation and moral narration. In Maharashtra for example, states Novetzke, a kirtan is a call-and-response style performance, ranging from devotional dancing and singing by a lead singer and audience, to an "intricate scholarly treatise, a social commentary or a philosophical/linguistic exposition", that includes narration, allegory, humor, erudition and entertainment – all an aesthetic part of ranga (beauty, color) of the kirtana. Kirtan is locally known as Abhang, Samaj Gayan, Haveli Sangeet, Vishnupad, Harikatha. The Vaishnava temples and monasteries of Hinduism in Assam and northeastern, called Satra, have a large worship hall named Kirtan ghar – a name derived from their being used for congregational singing and performance arts. In regional languages, Kirtana is scripted as Bengali: কীর্তন; Nepali & Hindi: कीर्तन; Kannada: ಕೀರ್ತನೆ; Marathi: कीर्तन; Punjabi: ਕੀਰਤਨ; Tamil: கீர்த்தனை; Telugu: కీర్తన. The Vedic sage Narada has been called an early Kirtana singer in the Puranas. An epilogue mantra at the end of a kirtan. Musical recitation of hymns, mantras and the praise of deities has ancient roots in Hinduism, as evidenced by the Samaveda and other Vedic literature. Kirtan were popularized by the Bhakti movement of medieval era Hinduism, starting with the South Indian Alvars (Vaishnavism) and Nayanars (Shaivism) around the 6th century, which spread in central, northern, western and eastern India particularly after the 12th century, as a social and congregational response to Hindu-Muslim conflicts. The foundations of the Kirtan traditions are also found in other Hindu scriptures such as the Bhagavad-gita where Krishna describes multiple paths to spiritual freedom, including karma marga (way of works), jnana marga (way of knowledge) and bhakti marga (way of loving devotion to god). Kirtan relates to the bhakti marga tradition of Hinduism. References to Kirtan as a musical recitation are also found in the Bhagavata Purana, an important Vaishnava text. Kirtan is often practiced as a kind of theatrical folk song with call-and-response chanting or antiphon. The ancient sage Narada revered as a musical genius, is called a kirtankar (singer of kirtan) in the Padma Purana. The famous story of Prahlada in the Avatara Katha mentions kirtan as one of nine forms of worship, called the nava vidha bhakti along with shravanam (listening), smaranam (remembrance), pada sevanam (service), archanam (offering), vandanam (obeisance), dasyam (servitude), sakhyam (friendship) and atmanivedanam (surrender). The so-called Naradiya Kirtan divides kirtan into five parts: naman (prayers), purvaranga (spiritual lesson based on old epics), chanting, katha or akhyan (exegesis) and a final prayer for universal welfare. Some Vaishnavism sub-traditions believe in public kirtan performance, with songs and dance. A painting of a 19th-century performance by Chaitanya group in Bengal. Kirtan as a genre of religious music has been a major part of the Vaishnavism tradition, particularly starting with the Alvars of Sri Vaishnavism sub-tradition between the 7th to 10th century CE. After the 13th-century, two subgenres of kirtan emerged in Vaishnavism, namely the Nama-kirtana wherein the different names or aspects of god (a Vishnu avatar) are extolled, and the Lila- kirtana wherein the deity's life and legends are narrated. The Marathi Varkari saint Namdev (c. 1270–1350) used the kirtan form of singing to praise the glory of god Vithoba, an avatar of Vishnu. Marathi kirtan is typically performed by one or two main performers, called kirtankar, accompanied by harmonium and tabla. It involves singing, acting, dancing, and story-telling. The Naradiya Kirtan popular in Maharashtra is performed by a single Kirtankar, and contains the poetry of saints of Maharashtra such as Dnyaneshwar, Eknath, Namdev and Tukaram.Learned poets from 17th and 18th century such as Shridhar, Mahipati, Moropant contributed to the development of this form of kirtan.' 'Jugalbandi Kirtan is performed by two persons, allowing question-answer, dialogue and debate. Performance requires skill in music, dance, comedy, oratory, debate, memory, general knowledge and Sanskrit literature. Training takes place at the Kirtan Kul in Sangli, the Akhil Bharatiya Kirtan Sanstha in Dadar, Mumbai, the Narad Mandir at Sadashiv Peth, Pune and the Kalidas Mahavidyalay in Ramtek, Nagpur as well as at smaller schools in Goa, Beed and Ujjain. Many Krishna-related kirtan center around his childhood and amorous love stories as a youth. In the early 16th century CE Chaitanya Mahaprabhu popularized adolescent Krishna based san-kirtana in Bengal, with Hare Krishna mantra and other songs, wherein the love between Radha and Krishna was symbolized as the love between one's soul and God. About the same time, Shankaradeva in Assam inspired Neo-Vaishnavite Bhakti movement that emphasized Advaita Vedanta philosophy within the framework of Bhagavata Purana and Vaishnavism. Shankaradeva helped establish Sattras (Hindu temples and monasteries) with kirtan-ghar (also called Namghar), for singing and dramatic performance of Krishna-related theosophy. Elsewhere, in Vrindavan of Braj region (Mathura), Vallabha launched a Kirtan singing devotional movement around the stories of baby Krishna and his early childhood, in early 16th century. In Andhra Pradesh,the compositions of Tallapaka Annamacharya, a 14th-century mystic, represent the earliest known music called sankirtana. He wrote in praise of Lord Venkateswara, the deity of Seven Hills in Tirumala, where unbroken worship has been offered for over twelve centuries at the Tirumala Venkateswara Temple. Annamcharya is believed to be the incarnation of Lord Venkateswara's sword. During his long and prolific career, he reputedly composed and sang 32,000 Sankirtanas and 12 Shatakas (sets of hundred verses). His works were in Telugu and Sanskrit. A Kirtan and a Bhajan are closely related, with both sharing common aims, subjects, musical themes and being devotional performance arts. A Bhajan is more free form, can be singular melody that is performed by a single singer with or without one and more musical instruments. Kirtan, in contrast, differs in being a more structured team performance, typically with a call and response musical structure, similar to an intimate conversation or gentle sharing of ideas, and it includes two or more musical instruments, with roots in the prosody principles of the Vedic era. Many Kirtan are structured for more audience participation, where the singer calls a spiritual chant, a hymn or a devotional theme such as from Vaishnavism, the audience then responds back by repeating the chant or by chanting back a reply of their shared beliefs. Sikh kirtan in traditional raga. Kirtan refers to devotional singing in Sikhism. It is typically performed at Gurdwaras (Sikh temples). Sikh scriptures and legends are usually recited in a song, to a certain raga and accompanied with musical instruments. The Gurus themselves created numourous musical instruments including the Dilruba, the Sarangi, the Esraj and a modification of the Pakhawaj creating an early form of the Tabla. A Shabad Kirtan refers to the musical recitation of the Guru Granth Sahib, the primary scripture in the Sikhism tradition which is arranged according to raga. The Shabad Kirtan can be listened to silently or sung along with the gathered congregation. 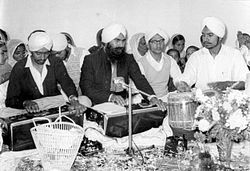 Kirtan in Sikh history has been the musical analog of Kathas recitation, both preferably performed by ragi jatha, or professional trained performers. A Sikh Kirtan is a religious, aesthetic and social event, usually held in a congregational setting on Sundays or over certain festivals to honor the historical Gurus, but major temples in the Sikh tradition recite Kirtan everyday as a mark of daily bhakti (devotional remembrance) of God's name. The congregational setting is called a Sangat or Satsang, a word that in ancient Indian texts means "like minded individuals, or fellow travelers on a spiritual journey". According to Guy Beck, the music tradition did not develop in early Buddhism possibly because it was considered sensual and inconsistent with its core teachings. Later Buddhism did develop monastic chanting of the canonical literature, particularly in the ritualistic Vajrayana and other Mahayana traditions. Chants, songs and plays about the life of the Buddha by the Buddhists of Bengal were called Buddha-samkirtan. A ISKCON kirtan performance in Moscow. Paramahansa Yogananda, a Bengali saint was an early proponent of kirtan in the west, chanting Guru Nanak Dev's Hey Hari Sundara ("Oh God Beautiful") with 3,000 people at Carnegie Hall in 1923. Kirtan became more common with the spread of Gaudiya Vaishnavism by the International Society for Krishna Consciousness's (ISKCON) founder A. C. Bhaktivedanta Swami Prabhupada in the 1960s. Kirtan singers have appeared in the West, such as Krishna Das, Bhagavan Das, Wah! and Jai Uttal as well as Snatam Kaur, Lokah Music, Deva Premal, Jim Gelcer, Jyoshna, Aindra Das, Gina Sala', and Gaura Vani & As Kindred Spirits. Yoga centers report an increase in attendance at kirtan; according to Pure Music’s Frank Goodman in conversation with Krishna Das in 2006, kirtan has taken on a wider popularity. There are also Kirtan singers in the west who sing authentic traditional Indian style Kirtans such as Kamini Natarajan and Sheela Bringi. In the United States case law, the term sankirtana has also been used to refer to evangelical activities of ISKCON. ISKCON had sought the right to perform sankirtana in California airports such as in Los Angeles. The court ruled that while ISKCON has a constitutional rights of protected speech, the Los Angeles airport also has a right to forbid any form of solicitation, out of "a legitimate interest in controlling pedestrian congestion and reducing the risk of fraud and duress attendant to repetitive, in-person solicitation of funds" by all groups including ISKCON. The male given name Kirtan or Keerthan is used in South India for females as well, particularly in Andhra Pradesh, Karnataka, Kerala and Tamil Nadu. ^ a b c d Ananda Lal (2009). Theatres of India: A Concise Companion. Oxford University Press. pp. 423–424. ISBN 978-0-19-569917-3. ^ a b Ananda Lal (2009). Theatres of India: A Concise Companion. Oxford University Press. pp. 422–424. ISBN 978-0-19-569917-3. ^ a b Alanna Kaivalya (2014). Sacred Sound: Discovering the Myth and Meaning of Mantra and Kirtan. New World. pp. 3–17, 34–35. ISBN 978-1-60868-244-7. ^ a b Peter Lavezzoli (2006). The Dawn of Indian Music in the West. A&C Black. pp. 371–372. ISBN 978-0-8264-1815-9. ^ a b Sara Black Brown (2014). "Krishna, Christians, and Colors: The Socially Binding Influence of Kirtan Singing at a Utah Hare Krishna Festival". Ethnomusicology. University of Illinois Press. 58 (3): 454–480. doi:10.5406/ethnomusicology.58.3.0454. ^ Jayant Lele (1981). Tradition and Modernity in Bhakti Movements. Brill Archive. p. 121. ISBN 90-04-06370-6. ^ Christian Lee Novetzke (2013). Religion and Public Memory: A Cultural History of Saint Namdev in India. Columbia University Press. pp. 75, 85–91. ISBN 978-0-231-51256-5. ^ Manohar Laxman Varadpande (1987). History of Indian Theatre. Abhinav. pp. 95–96. ISBN 978-81-7017-278-9. ^ Varadpande, Manohar Laxman (1992). History of Indian Theatre. 2. Abhinav Publications. p. 95. ISBN 9788170172789. ^ Arthur Anthony Macdonell (1924). A Practical Sanskrit Dictionary. Motilal Banarsidass. p. 69. ISBN 978-81-208-2000-5. ^ Sukumar Chattopadhyay; Kapila Vatsyayan (2008). Kalātattvakośa: Appearance. Motilal Banarsidass. pp. 67–69. ISBN 978-81-208-3286-2. ^ Antonio Rigopoulos (1993). The Life And Teachings Of Sai Baba Of Shirdi. State University of New York Press. p. 275. ISBN 978-0-7914-1267-1. ^ Nye, Malory (1995). A Place for Our Gods. Routledge. p. 124. ISBN 978-0-7007-0356-2. ^ Christian Lee Novetzke (2013). Religion and Public Memory: A Cultural History of Saint Namdev in India. Columbia University Press. pp. 275–281. ISBN 978-0-231-51256-5. ^ Ronald M. Bernier (1997). Himalayan Architecture. Fairleigh Dickinson University Press. p. 28. ISBN 978-0-8386-3602-2. ^ Constance Jones; James D. Ryan (2006). Encyclopedia of Hinduism. Infobase. p. 378. ISBN 978-0-8160-7564-5. ^ Guy L. Beck (2012). "Chapter 1". Sonic Liturgy: Ritual and Music in Hindu Tradition. University of South Carolina Press. pp. 12–24, 30–33. ISBN 978-1-61117-108-2. ^ Guy L. Beck (2012). "Chapter 1". Sonic Liturgy: Ritual and Music in Hindu Tradition. University of South Carolina Press. pp. 32, 108–120. ISBN 978-1-61117-108-2. ^ Guy L. Beck (2012). Sonic Liturgy: Ritual and Music in Hindu Tradition. University of South Carolina Press. pp. 115–118, 131–133. ISBN 978-1-61117-108-2. ^ Kelkar, M.; Mahabal, K. (2007). Keertanrang (Marathi: कीर्तनरंग). Dadar, Mumbai, India: Akhil Bharatiya Keertan Sanstha. p. 1. ^ Koparkar, G. N. (2000). Katha Haridasaanchi (Marathi: कथा हरिदासांची). Pune, India: Keertan Mahavidyalaya Prakashan. p. 2. ^ John A. Ramsaran (1973). English and Hindi Religious Poetry: An Analogical Study. BRILL Academic. pp. 3–4. ISBN 90-04-03648-2. ^ Emmie te Nijenhuis; Muttusvāmi Dīkṣita; Sanjukta Gupta (1987). Sacred songs of India. Amadeus. pp. 5–6. ISBN 978-3-905049-36-7. ^ Dixit, Durga (2009). Diamond Maharashtra Sankritikosh (Marathi: डायमंड महाराष्ट्र संस्कृतीकोश). Pune, India: Diamond Publications. p. 166. ISBN 978-81-8483-080-4. ^ a b Catherine B. Asher; Cynthia Talbot (2006). India before Europe. Cambridge University Press. pp. 110–112, 148–149. ISBN 978-1-139-91561-8. ^ Kaliram Medhi (1978). Studies in the Vaiṣṇava Literature & Culture of Assam. Assam Sahitya Sabha. pp. 6, 43. ^ Ronald M. Bernier (1997). Himalayan Architecture. Fairleigh Dickinson University Press. pp. 27–28. ISBN 978-0-8386-3602-2. ^ Alanna Kaivalya (2014). Sacred Sound: Discovering the Myth and Meaning of Mantra and Kirtan. New World. pp. 117–122. ISBN 978-1-60868-244-7. ^ a b c d Knut A. Jacobsen; Kristina Myrvold (2012). Sikhs Across Borders: Transnational Practices of European Sikhs. Bloomsbury Academic. pp. 112–114. ISBN 978-1-4411-7087-3. ^ Arvind-Pal Singh Mandair (2013). Sikhism: A Guide for the Perplexed. A&C Black. p. 24. ISBN 978-1-4411-0231-7. ^ Sikh sacred music. Oxon: Sikh Sacred Music Society. 1967. p. 63. ^ Narayan, Badri (2017). Culture and Emotional Economy of Migration (First ed.). Routledge. p. 75. ^ Knut A. Jacobsen; Kristina Myrvold (2012). Sikhs Across Borders: Transnational Practices of European Sikhs. Bloomsbury Academic. p. 113. ISBN 978-1-4411-7087-3. ^ Anand, Balwant (1983). Guru Nanak His Life was his Message: a Biography. Guru Nanak Foundation. p. 224. ^ Arvind-Pal Singh Mandair (2013). Sikhism: A Guide for the Perplexed. A&C Black. pp. 30–31. ISBN 978-1-4411-0231-7. ^ Frisk, Liselotte (2002). "The Satsang Network". Nova Religio. 6 (1): 64–85. ^ a b Guy Beck (1998). "South Asia, the Indian subcontinent". In Bruno Nettl; et al. (eds.). The Garland Encyclopedia of World Music. Routledge. p. 257. ISBN 978-0-8240-4946-1. ^ Sukomal Chaudhuri (1982). Contemporary Buddhism in Bangladesh. Atisha Memorial. p. 81. ^ Yogananda, Paramhansa (2007). Autobiography of a Yogi. BiblioBazaar, LLC. pp. 526–527. ISBN 978-1-4264-2415-1. ^ Jackson, Carl T. (1994). Vedanta for the West. Indiana University Press. p. 134. ISBN 0-253-33098-X. ^ Goodman, Frank (January 2006). "Interview with Krishna Das" (PDF). Puremusic (61). Retrieved 15 January 2014. ^ Eckel, Sara (5 March 2009). "Chanting Is an Exercise in Body and Spirit". The New York Times. Retrieved 21 April 2009.